We take custom orders for special occasions such as weddings, anniversaries, births, or retirement. 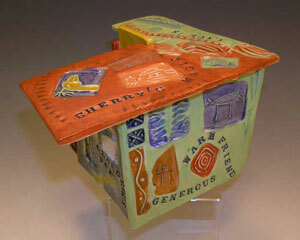 Some examples of past work include a jewelry box for a bride that was inspired by family stories of the women in her family. You should have been at the shower when the gift was presented...what a way for bride and groom families to get to know each other by telling all those wonderful stories! Another is a Wedding Bowl that was designed for a couple with symbols from a Rune wedding ceremony. It was designed as part of our Ancient Voices line. Or, one in production now is a bowl that was signed by all those who attended a wedding and after other decorative elements were added by the artist is being glaze fired for a permanent memory of a glorious evening. Click on the image below for examples of a Storyboxes that were custom made as birthday gifts. Contact Amy to discuss details.